I am a durian lover and look forward to every durian season to satisfy my craving for the thorny King of Fruits. 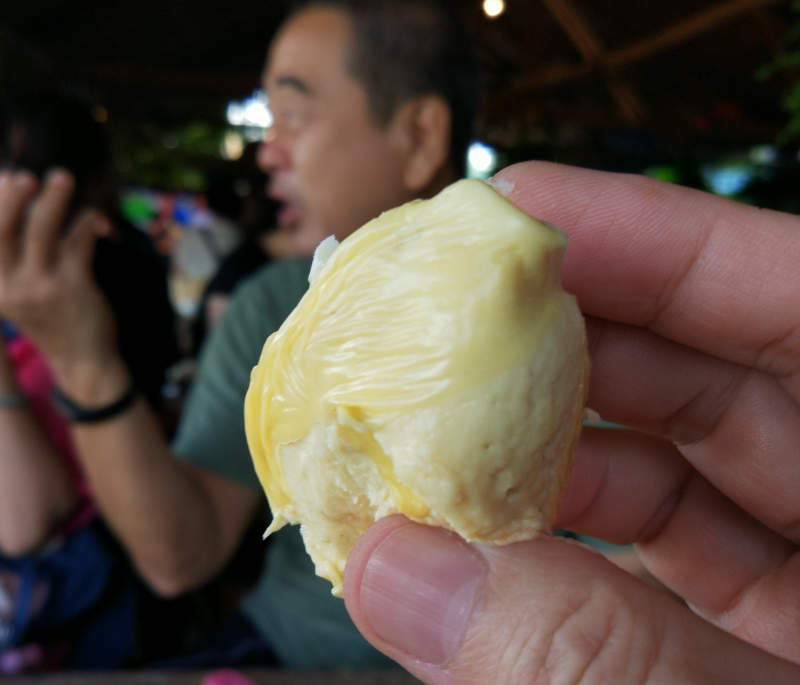 The bittersweet and creamy “Musang King” has been my favourite until I tasted the numbing flavour durians at Bao Sheng Durian Farm in Penang. 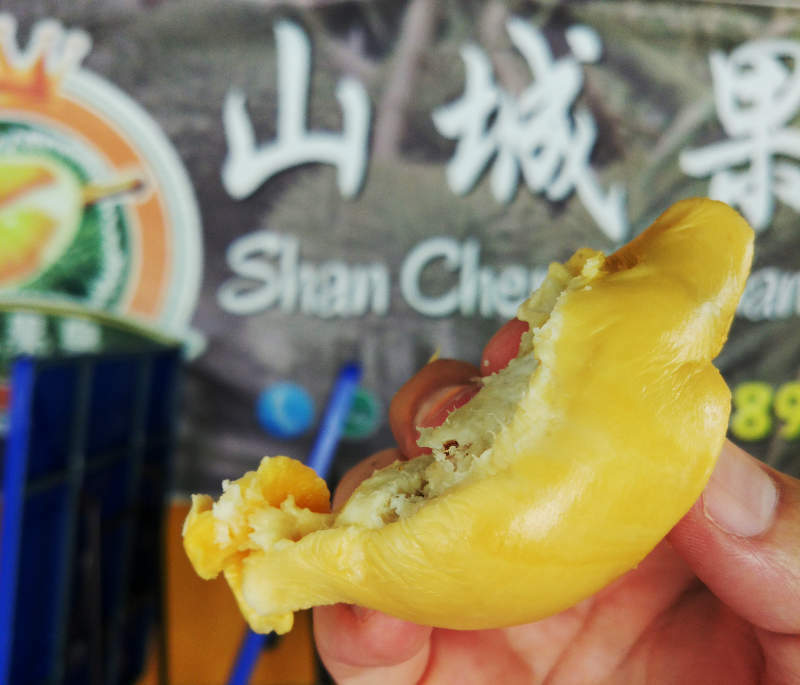 I came to know about Bao Sheng Durian Farm from a Facebook post written by Year of the Durian and the gluttony thought of eating nothing but durians crossed my mind. That’s when I decided I’ve to make a trip up north to Penang and stay a night at the durian farm to taste the freshest organic durians. Our durian adventure to Bao Sheng Durian Farm was part of a longer trip which included 4 nights in Penang, then followed by 2 nights in Kuala Lumpur. Besides craving for Penang durians, the street food around Georgetown was mouthwatering too and we had a blast. The reason to travel to Kuala Lumpur was to make a trip to Raub for the “Musang King” and steamed river fish at Restoran Sentosa. Instead of taking budget airlines from Singapore to Penang, we chose a cheaper option – a 10-hour express bus ride** from Golden Mile Complex to Sungai Nibong Bus Terminal. We took the overnight Sri Maju express bus and a one-way bus ticket cost SGD45. Our plan was to arrive Penang early to try out the local breakfast, visit Balik Pulau town to look for durian stalls and have lunch before the 3pm check-in at Bao Sheng for the 2D1N Durian Farmstay. We had the “original” Penang Char Koay Teow and very tasty dried oyster porridge at Super Tanker Food Centre, located less than 10-minute walk from Sungai Nibong Bus Terminal. After a hearty breakfast, we booked a private-hire car (via Grab) to Bao Sheng Durian Farm to leave our luggage and head to Balik Pulau town to look for Shan Cheng Durian (山城果皇), a durain stall recommended by Penang Holiao (槟城好料). We had D2, D11, D604 and Penang’s very own “Ang Heh” (Red Prawn). This was the first time I tasted Red Prawn and it soon became my “new love”. I think the “Ang Heh” in Penang tasted far better than any Musang King durians I had eaten in Singapore. After Shan Cheng Durian, we had lunch at Half Acre Restaurant to try out the baked chicken specially cooked in a giant urn with wood fire. We arrived Bao Sheng Durian Farm at 2pm to check-in but were told the room would be ready by 3pm. Instead, we were invited to join the durian buffet which we politely declined because we were very full and literally in a state of food coma. The owner must be taken by surprise, saw our lethargy and quickly got us a room at 2.30pm. We actually regretted having eaten the lunch and missed the first durian tasting session. After a good nap and a refreshing shower, at about 6pm, we went to the dining area for the sunset view and enjoyed the second pre-dinner durian session. In this evening session, I had both of my favourite fruits: Durians and Rambutans! The rambutans were extremely fresh, succulent and juicy – really “farm fresh”. The durian tastes heavenly. 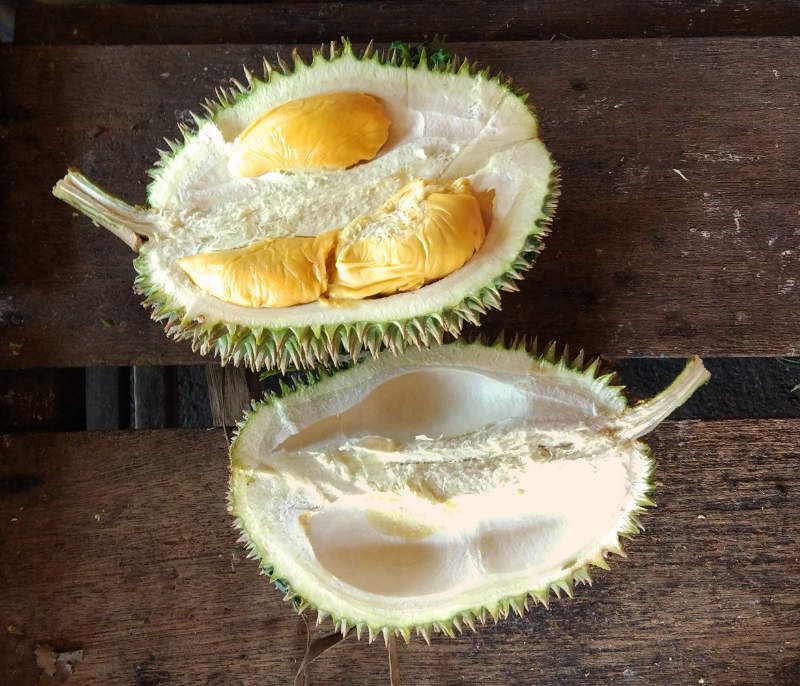 The freshness, flavour, creaminess and texture of these thorny King of Fruits picked from the nearby trees in the hills of Balik Pulau exceeded my expectation and imagination. 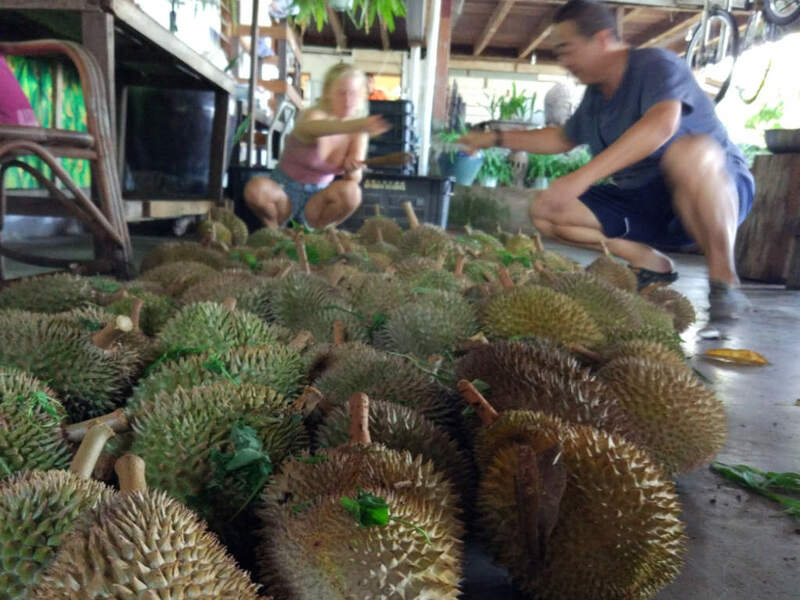 The quality of durians sold in Singapore could never come close to the experience of the tasting durian straight from an organic farm. I was gorging on the durians so quickly that I forgot to ask what type of durian I was eating. In fact, I was too busy putting one durian after another into my mouth that I actually did not take any photo of the durians I had eaten. If you’re interested to see the durian photos, go visit Bao Sheng’s website. In this trip, I learned that a real durian connoisseur doesn’t bother too much about the durian type or breed as long as it is fresh and free from pesticides. When you see bees hovering over your seed of durian, you know that the durian is fresh and smells fragrant. I may be a durian lover but a total novice in durian tasting. The owner of Bao Sheng Farm, Mr Chang Teik Seng, on the other hand, is a true durian connoisseur. 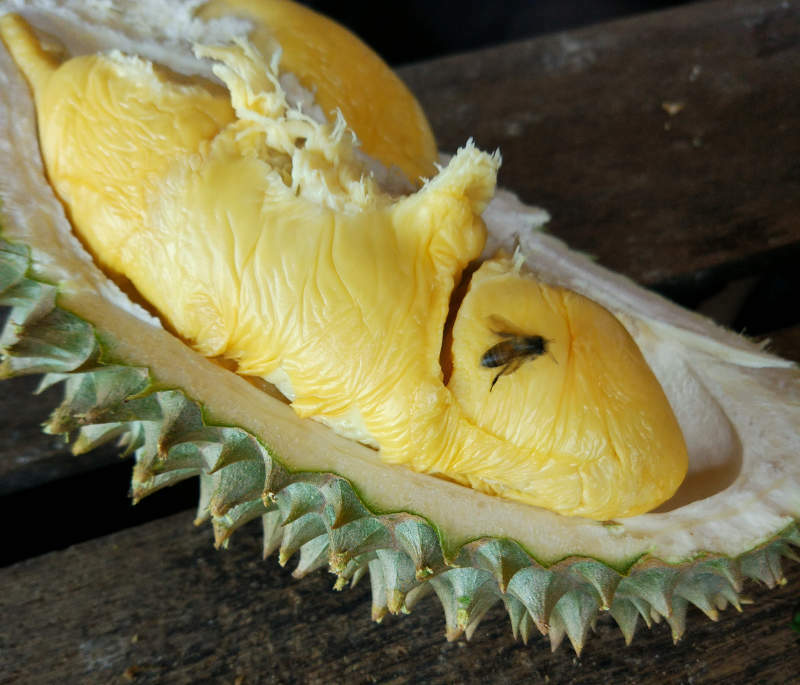 He could easily pick and serve a variety of durians to showcase five different tastes of durians: sweet, bitter, floral, alcoholic and numbing. To help us to differentiate the taste, Chinese tea (Pu’er) was served during the tasting session to cleanse our palate while we were sampling the different durian types. 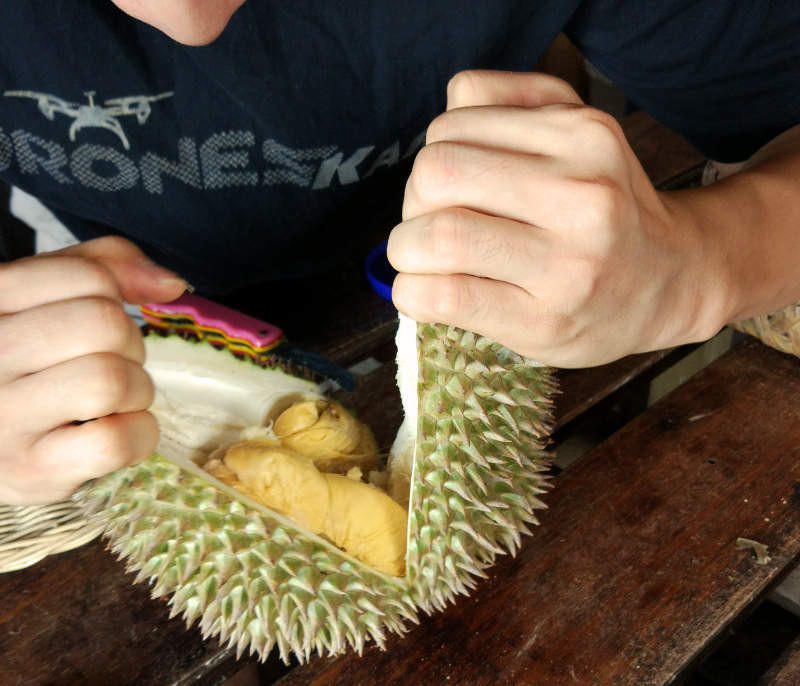 However, the ultimate fifth taste – the “numbness” sensation of the durian could only be experienced the next morning. The next day morning was our durian-tasting-session finale. Early in the morning, we finally tasted the freshly picked durians (dropped from the trees for less than two hours) with the “numbing sensation” taste. The tingling, sweet, and savoury taste was very complex and hard to describe. It was my first time to experience such flavour and taste; probably also the first encounter for all the guests who spent a night at the farm. After a quick breakfast, we had a tour of the nearby plantation where Mr Chang shared interesting stories about Bao Shen Farm history and his future plans. We left the farm at noon and managed to book a private-hire car to George Town. While waiting for the pick-up, we were already planning for the next durian season. We were advised that booking has to start as early as next March so that we can reserve the villa with the gorgeous sunset view!